I know I promised you guys a cupcake website, but until that’s up and running, I couldn’t wait to share and absolutely amazing cupcake recipe … make with BLACK BEANS of all things. However, if someone were to have given this cupcake without telling me what was in it, I never would have guessed it was gluten-free and made with black beans. 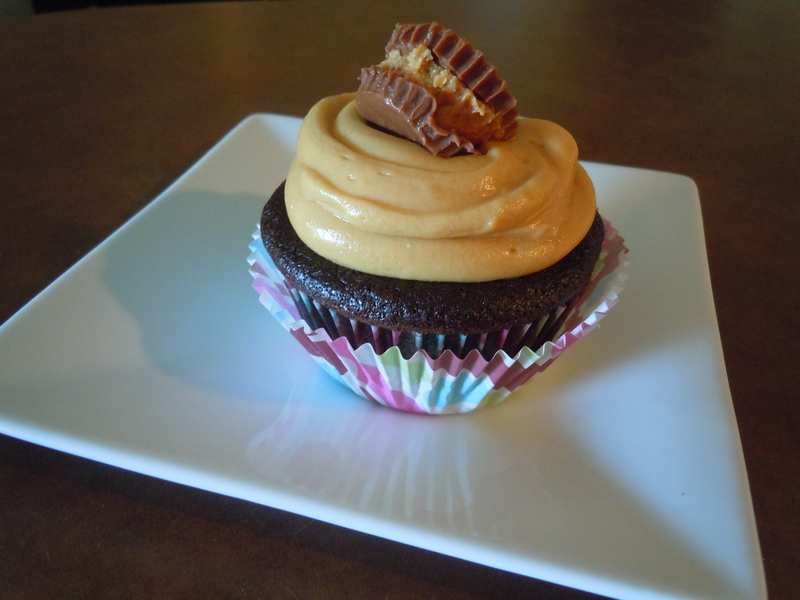 The chocolate and peanut butter are totally the stars of these cupcakes. For all you poor college students out there who can’t afford fancy mixers or other equipment, but still want to make cupcakes from scratch, I promise these are super easy to make. All you need (special tools-wise) is a blender and a semi-strong arm. 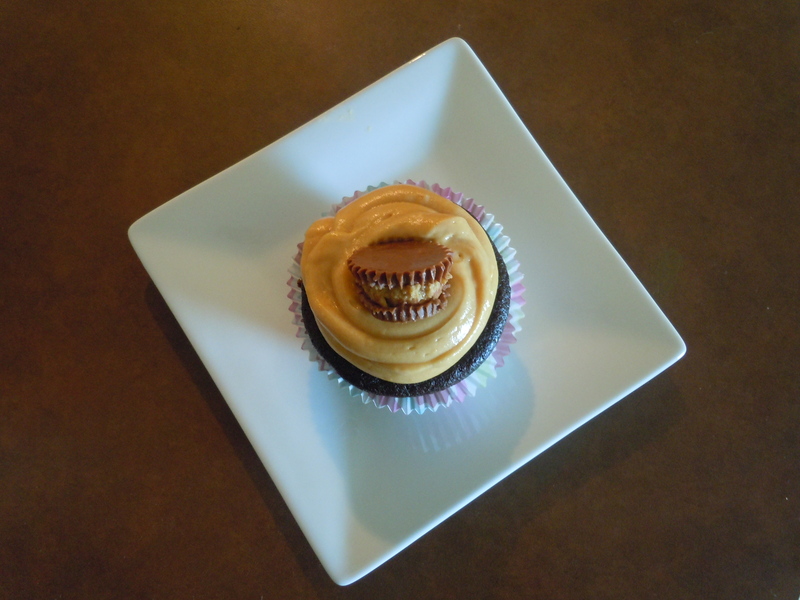 This is my first cupcake post, so please forgive all the amateur photos and excitement :D. For all you peanut butter and chocolate lovers out there, this is probably one of the best cupcakes I’ve ever eaten!! And then to think I MADE them! …. craziness. Credit for the recipe goes to Chocolate and Carrots. View her page for the really awesome photos and other recipes :). Line a 12 cup muffin pan and spray with cooking spray. Blend the beans, 2 eggs, vanilla and sugar in the food processor (or blender) on high until completely blended. In a small bowl combine the cocoa powder, baking powder and baking soda. In a large bowl, beat the butter/coconut oil until fluffy. Add the remaining two eggs and beat well after each egg. Beat in the bean mixture. 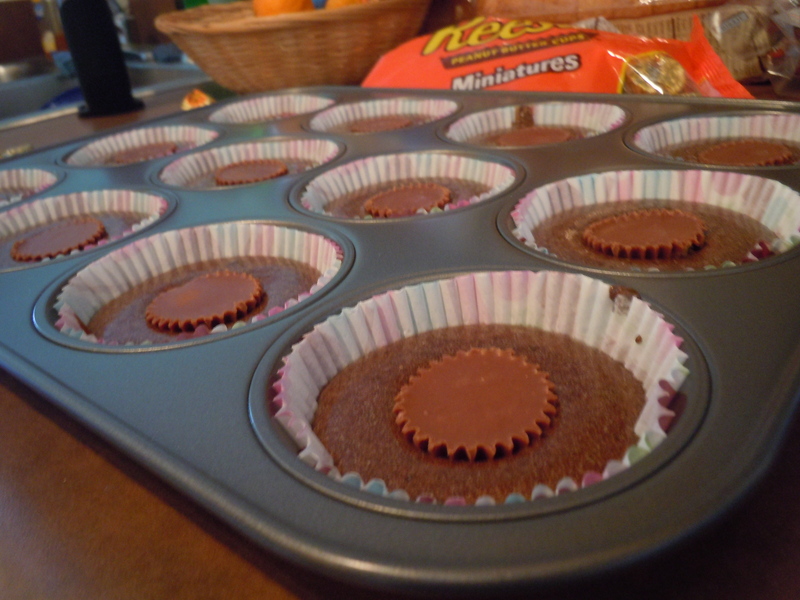 Pour the batter into the prepared pan and place a Reese’s cup on the top. Bake for about 20-25 minutes until the cupcakes are cooked completely. Allow them to cool completely before icing. Beat the peanut butter, butter and powdered sugar until combined. Add in the whipping cream and beat until light and fluffy. Put in a ziplock bag, cut a hole, and decorate the cupcakes OR use a piping bag with your favorite decorating tip and decorate the cupcakes OR use a knife and spread to decorate the cupcakes. 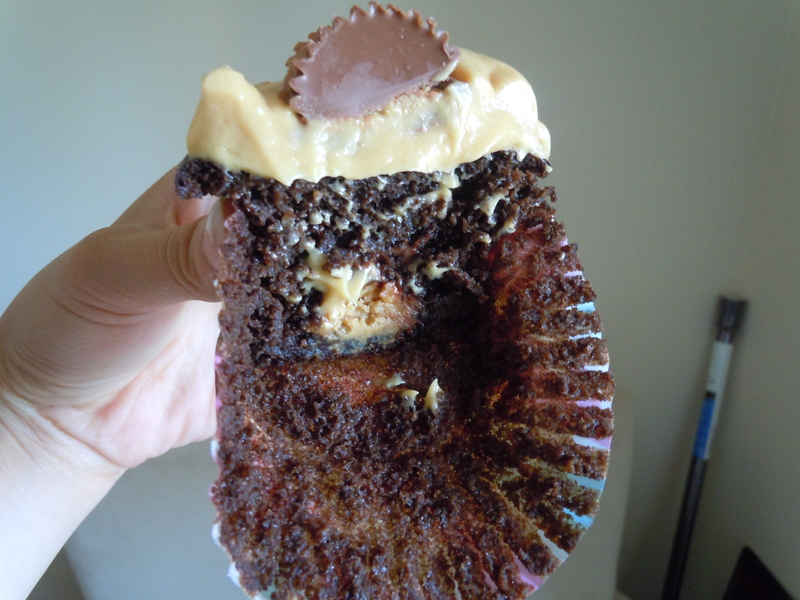 Decorate with a mini Reese’s Peanut Butter Cup. ~ by Candis on June 12, 2011. Yum! Your cupcakes look fabulous Candis! Thanks for the link up! 🙂 Yay for GF chocolate and peanut butter cupcakes!!! Oh my gosh, I am so gonna try this recipe tomorrow. I have black beans in the cabinet, one of my staples. Gluten free family, always looking for less expensive ways to fill in the snack blank. Woo hoo thank you! Wow, definitley trying these for Friday movie night, they look amazing. It’s the best of many worlds!!! Thank you, thank you, thank you! Your recipe looks really yummy… with one big problem. 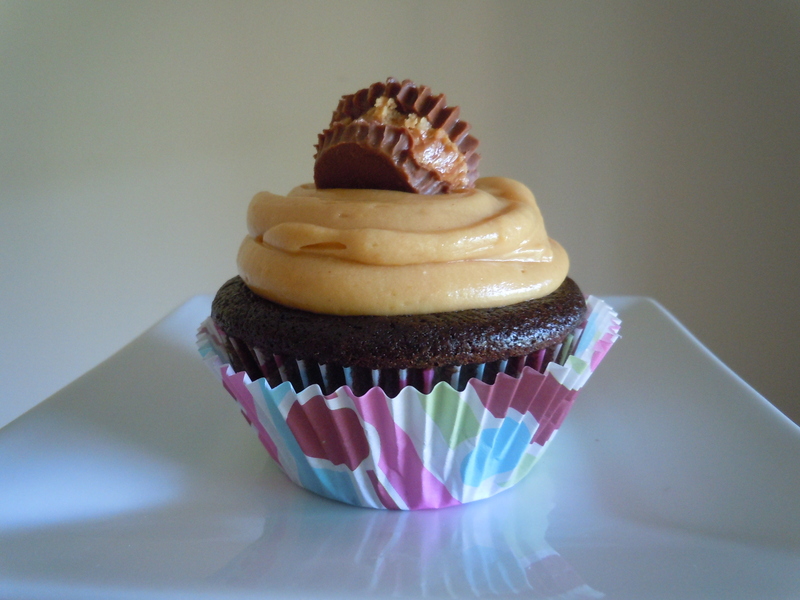 For those who are on a Gluten Free diet, Reese’s Peanut Butter Cups are NOT gluten free! (This may be confirmed at Celiac.com). Instead of using RPBC’s, substitute a teaspoon of peanut butter on the batter, and then leave them off as decoration on top. Also, check to make sure the powdered sugar you’re using is GF! I’ve tried these and they are really yummy!! !